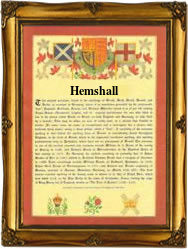 This is an English locational surname recorded in the spellings of Hempshall, Hempsall, Hempsell, Hemshill, Hemsall, Hemsell, Hemsale, Hemsil, and no doubt others. It is locational from the village of Hempshill in Nottinghamshire. The translation of the place name is the settlement on th hill from the pre 7th century Olde English words 'hamm' and 'hyl'. The village is first recorded in the Domesday Book of 1086 as 'Hamessel', and in 1200 as 'Hameshil'. During the Middle Ages, when it was becoming increasingly common for people to migrate from their village of birth to seek work, they would adopt or more likely be given, their original village name as an easy means of identification. As spelling was at best rudimentary and local accents extremely 'thick', this often resulted in a wide range of spellings. Early recordings of the surname include Arthur Hempsall, who married Joane Morehouse, on 28th April 1605 at St. Giles Cripplegate, in the city of London, and Matthew Hemsil, christened at Darfield, Yorkshire, on December 26th 1802. The first recorded spelling of the family name is shown to be that of William Hampsall. This was dated December 28th 1602, when he was christened at Laxton, in Nottinghamshire, during the reign of Queen Elizabeth I, known as "Good Queen Bess", 1558 - 1603. Throughout the centuries, surnames in every country have continued to "develop" often leading to astonishing variants of the original spelling.